Setting higher standards! – Customer Service Perfected! Don’t just control your pest problem – eliminate it! You have too much at stake in your commercial establishment to risk a pest problem. Contact the Academy for guaranteed pest elimination; then once your pest problem is eliminated; our monthly service will assure your business remains pest free. All of our highly trained technicians are licensed with a Field Rep License Branch 2 by the State of California, and have extensive field experience. Having been involved with true pest elimination from its beginning, we gained experience servicing major national hotel and restaurant chains. We bring this experience in Integrated Pest Management to our current work and understand the difference between pest control and true pest elimination – and we guarantee our success. Academy is licensed, fully insured, and all technicians are bonded. Commercial Services – Leading the industry! We are experts in AIB, USDA and other food processing audits. Let us set up your pest control audit program and we can guarantee you a 100% passing grade on all of your audit inspections! 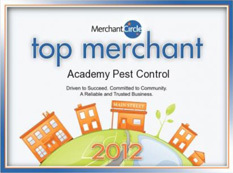 We have a vested interest in providing a safe, environmentally conscious, cost-effective solution for your pest problems. Our integrated approach to controlling pests for your business has several steps to insure a safe and pest-free environment. At Academy we give our commercial clients the best and most technologically advanced service in the business.